Tactic: Use the map to plan events. The map feature in EverTrue allows you to search all over the world to create location-based lists of alumni, then segment those lists by age, industry, college or university, and more, giving you valuable information when planning new events. 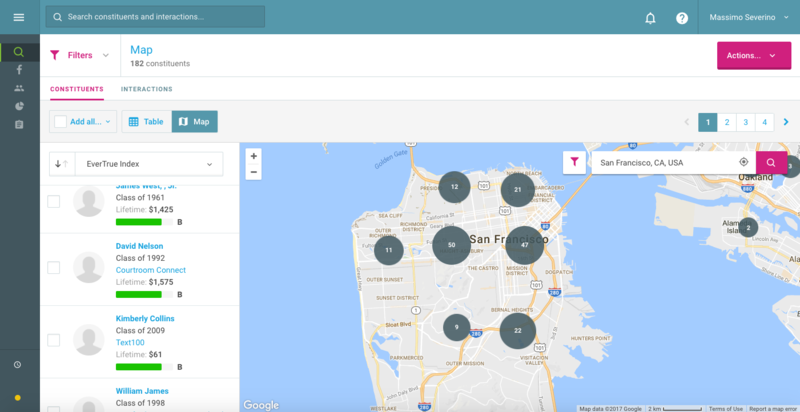 For example, you can search a map of San Francisco, then zoom in by neighborhood, and use career information from LinkedIn and your own database to see how many alumni work in the tech sector. Use this information to choose a location and invitees for a panel discussion and networking event on startups, entrepreneurship, and more. Results: Create great industry networking programs, location-based events, age-based get-togethers, and more.